TOOLS, OILS AND OTHER DIY >>. Gift Ideas & Special Offers. CD Rom, Books and Manuals. Discovery 1 1994 to 1998. Delete this and add your own html code. 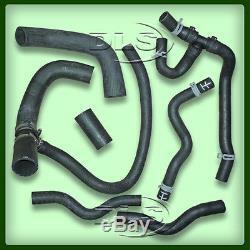 RANGE ROVER P38 4.4/4.6V8 "THOR" PETROL COOLING HOSE SET`99 on. PART N&###xB0;: &###xA0; &###xA0;DLS367 &###xA0; (for reference only). YOU ARE CURRENTLY VIEWING THE SALE FOR A BRAND NEW, QUALITY&###xA0; REPLACEMENT COOLING WATER HOSE SET. SET COMPRISES OF: IN/OUT HEATER HOSES, TOP HOSE, BOTTOM HOSE, BYPASS HOSE, PUMP TO STAT HOSE, HEATER TO STAT HOSE. MADE UP OF A SELECTION OF GENUINE AND REPLACEMENT HOSES. Range Rover - P38 - 4.4/4.6V8 "Thor" petrol models - from VIN XA000001. &###xA0; USE CHASSIS/VIN (last 8) FOR POSITIVE ID. A VISUAL CHECK IS ADVISED BEFORE ORDERING THIS ITEM. IF YOU WISH TO PAY BY CREDIT OR DEBIT CARD, PLEASE CALL 01629 822185. WE ACCEPT MOST MAJOR CREDIT AND DEBIT CARDS. Over 30 years experience providing a top quality service for Land Rover owners, supplying Parts and Accessories for all models inc. Series, Defender, Discovery, Range Rover and Freelander. If you wish to pay by credit/debit card then please call 01629 822185 or +44 1629 824361 and one of our helpful staff will take your details. The cheque must also carry on the reverse, your address, telephone number and valid cheque guarantee card number. We cannot accept responsibility for cheques or postal orders lost or delayed in the post. Delayed payments will incur an "Unpaid Item Dispute" being raised against you! Rates do vary depending on region/country and you can access the different areas by clicking the relevant button within the item listing. For large multiple consignments upto 30kgs, the same rules above apply. For anything over this limit you will be advised even if you have already paid for your items we will advise you that you have gone over the 30kg limit and there will be further charges that would have to be met before the despatch of goods. General Terms & Conditions 1. General These conditions prevail over any conditions which the purchaser's order may purport to impose and which are at variance with the same. No modification of these conditions shall be binding on the company (DLS UK Ltd) unless specifically accepted in writing by the company (DLS UK Ltd). We cannot accept any claims for errors in our catalogue/website which may have been made inadvertently. We reserve the right to make changes without prior notice. This price list supersedes and replaces any other price list issued. Prices The company (DLS UK Ltd) reserves the right to vary the quoted price, and goods will be invoiced to the purchaser at the prices ruling at the date of dispatched unless otherwise agreed by this company in writing. Ex works packaging and carriage charges will be extra. The Companys liability for loss or damage in transit shall be limited to the amounts, if any, recovered from the shippers and insurers less any costs of this Company has suffered in connection with a claim. The Company shall in no circumstances be liable for any consequential loss or damage. All descriptions of spare parts are intended as a guide only and do not necessary indicate Land Rover Company manufacture. Exclusions of Liability These conditions are in substitution foe and exclude all and any express and implied statutory rights or other warranties, guarantees, representations, conditions and liabilities. Acceptance of order Quotations do not constitute an offer by the Company to supply the goods, and no orders shall be binding unless accepted by the Company in writing. DLS will not be liable for lost or damaged items on return or labour costs. Items may then be sent back our supplier who with then undertake tests to confirm the fault. Faulty or damaged goods will be replaced on receipt of the item with DLS (UK) Ltd only if accompanied by a valid invoice and in its original packaging. Purchasing your items through the "Shopping Basket" we cannot edit your invoice. You will have to pay the full total! This listing is currently undergoing maintenance, we apologise for any inconvenience caused. The item "RANGE ROVER P38 4.4/4.6V8 THOR PETROL COOLING HOSE SET`99 on" is in sale since Tuesday, March 20, 2012. This item is in the category "Vehicle Parts & Accessories\Car Parts\Engine Cooling\Hoses & Clamps". The seller is "pdt010" and is located in Matlock. This item can be shipped worldwide.